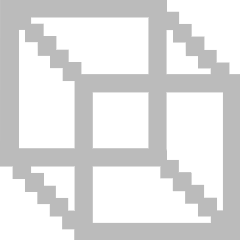 See more objects with the color silver rosybrown grey dimgrey or see all the colors for this object. This is a Drawing. It was designed by Smart Design, Inc. and drafted by Davin Stowell. It is dated January 4, 1990 and we acquired it in 2011. Its medium is print on white wove paper. It is a part of the Drawings, Prints, and Graphic Design department. 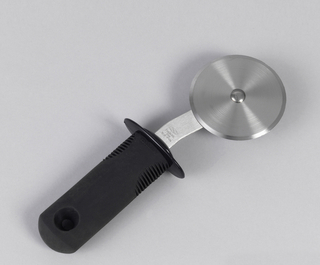 Smart Design and OXO Good Grips kitchen tools rank among the most successful domestic consumer products of the late 20th century. 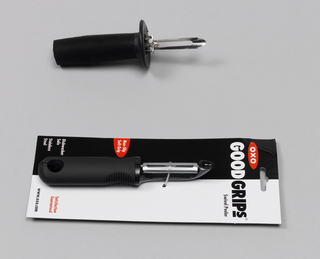 When they were first issued 1992, the museum acquired examples of the full line of OXO Good Grips kitchen tools as a gift from the OXO company. 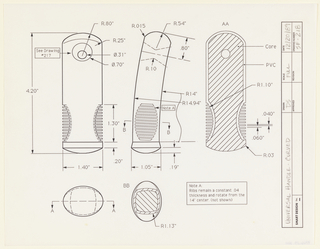 These drawings from the first series of Good Grips products help document the use of new materials and ergonometric principles in the design process of the firm Smart Design, which received the design commission for these products from OXO’s founder, Sam Farber. These proposed drawings are not conceptual sketches. According to Smart Design’s principals, Dan Formosa and Davin Stowell (Tucker Viemeister, the third original principal, is no longer with the firm), Smart Design rarely executes concept sketches for its projects. 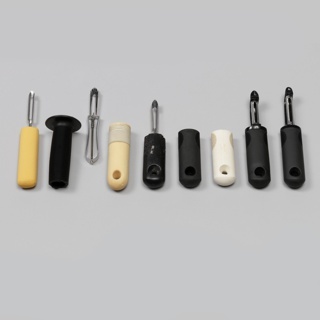 They most frequently work with existing products that they refashion by adding foam or other materials to achieve a three-dimensional mock-up of their new product. The drawings proposed for acquisition are fabrication drawings from the final early model for the production of the prototypes. The Good Grips drawings are especially instructive because they represent a period at the end of the 1980s when designers were transitioning between drawing by hand and drawing over photocopies to the early 1990s when they turned to computer-generated drawings. 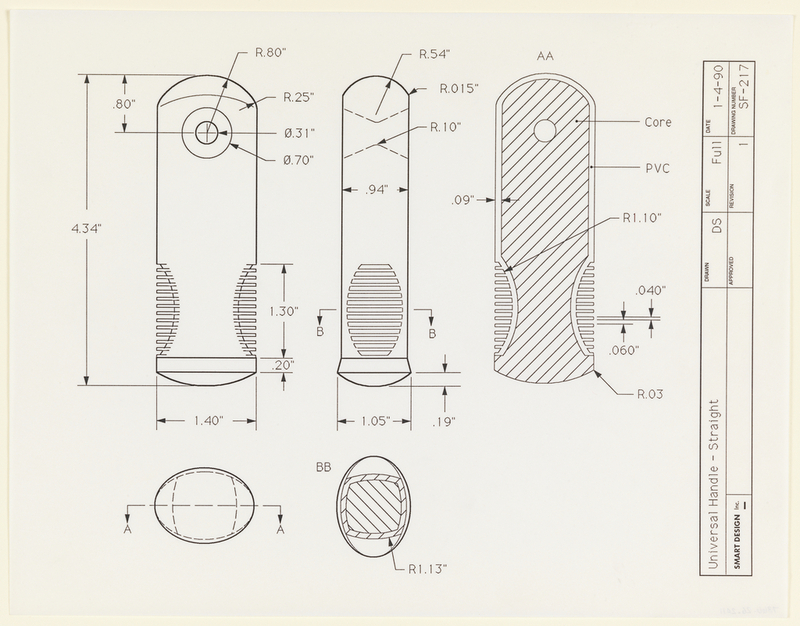 Included in the proposed group are three drawings for the OXO Good Grips lemon peeler, two drawings for the pizza wheel, one drawing for the garlic press, and three computer-generated drawings for the "universal handle.” According to Stowell, who executed the “universal handle” drawings, they represent his earliest experience with generating designs solely by computer. These design drawings will enable us to explain and display the evolution of these iconic kitchen implements, and speak to Smart Design’s ongoing design process and concern for consumer needs. 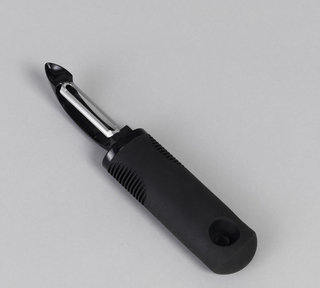 Printed in black ink in title block along right margin: Universal Handle - Straight / DRAWN DS / SCALE Full / DATE 1-4-90 / SMART DESIGN INC. / APPROVED / REVISION 1 / DRAWING NUMBER SF-217.